Eastern senior Tyler Davis releases an attempt during the second flight of the Division III shot put event held Friday afternoon at Jesse Owns Memorial Stadium in Columbus, Ohio. COLUMBUS, Ohio — No finalists, but still a lot of good memories. The Ohio Valley Publishing area went scoreless on the first day of the 2018 OHSAA Track and Field Championships held Friday at Jesse Owens Memorial Stadium on the campus of Ohio State University. The Eastern senior-junior duo of Tyler Davis and Noah Browning both missed the finals in their respective Division III events, while Gallia Academy senior John Stout also came up an eye-blink short of competing in the Division II finals on Saturday. Stout — appearing in his first-ever state event at Jesse Owens Stadium — had the sixth-fastest time in his heat of the Division II 200m dash with a mark of 22.46 seconds. Stout ended up 14th out of 18 competitors and missed the final qualifying spot by roughly one-fifth of a second. The Blue Devils — who last scored points at the 2014 Division II meet — have had at least one male competitor at Jesse Owens for five consecutive postseasons. 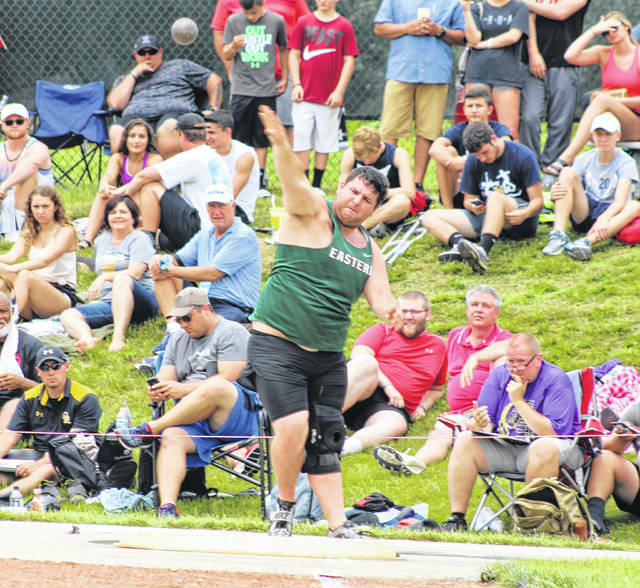 Davis — appearing in his first-ever state event at Jesse Owens Stadium — placed 15th out of 16 competitors in the Division III shot put event with a throw of 46 feet, 7¾ inches. Davis ended up missing the final qualifying mark by more than five feet and was also eighth of eight competitors in the second flight. Browning — also appearing in his first-ever state event at Jesse Owens Stadium — ended up eighth out of nine competitors in the second of two Division III 400m dash semifinals on Friday. Browning’s time of 51.96 seconds was three-quarters of a second off the final qualifying mark and ended up being the 16th-best effort out of the 18 total entrants. The Eagles — who last scored points at the 2012 Division III meet — have had at least one male competitor at Jesse Owens for four consecutive postseasons. The OVP area has more chances at podium finishes on Saturday at Jesse Owens Memorial Stadium. Meigs junior Kassidy Betzing competes in her third consecutive Division II long jump event at 9:30 a.m.
Eastern senior Jessica Cook makes her second appearance in three years in the Division III 800m final at 10:55 a.m.
River Valley senior Nathaniel Abbott will make his state debut in the Division II 800m final at 2:35 p.m.
Visit ohsaa.org for complete results from the opening day of the 2018 OHSAA Track and Field Championships being held at Jesse Owens Memorial Stadium. A complete recap of Saturday’s results will be available in the Tuesday sports editions of the Gallipolis Daily Tribune, Point Pleasant Register and The Daily Sentinel.